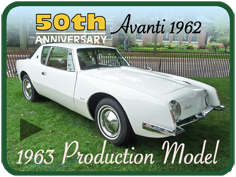 2012 is the 50th anniversary of the introduction of the production model 1963 Studebaker Avanti. During 1962 three distinct occasions marked the public response to that introduction. First, the sensational unveiling at the 1962 New York International Auto show on April the 26th; second, the first appearance at Studebaker showrooms across the country during the mid summer months; and third, the first arrival on the roads of America of the 1963 production model. By the fall of 1962 Studebaker's Swan Song, Loewy's Masterpiece, and the Palm Springs Design Team's vision had become a dream come true. In late 1962, Andy Granatelli broke 29 Bonneville speed records with a Studebaker Avanti, traveling faster than anyone had before in a stock American car. 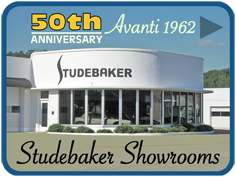 Auto Show - The new Studebaker Avanti was first shown to the public on April 26, 1962 at the New York International Auto Show. It was a sensation. It was called startling, unconventional, sizzling, elegant, and a "knock-out." Among the cars' enthusiastic fans were Ford stylists whose work on the 1964 1/2 Mustang would be significantly influenced by the Avanti. 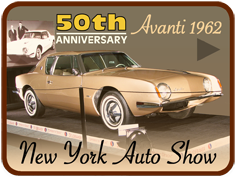 The 2007 Canadian International Auto Show in Toronto featured a re-creation of the Studebaker Avanti exhibit at the 1962 New York Auto Show. Showrooms - Early production model Avanti models began to appear in Studebaker showrooms throughout the summer months. The car's radical styling and unconventional engineering got the attention of the automotive press. Canada Track & Traffic called it "A bold, fresh concept with an undeniable feeling of motion that makes Avanti's competitors seem decidedly old-fashioned." Sportscar World said "Studebaker's startling Avanti has caused raised eyebrows among diehards in the American motor industry, who have already nicknamed it America's 'Ferrari'." Production Model - At the forward end of the long hood, there is no grille. Air is ducted to the radiator through a scoop below the slender, blade-like bumper. The hood is a simple, angular shape with no embellishments other than single headlights set inboard and a tapering asymmetric bulge that forms a cowling over the interior instrument cluster. Fenders are severely indented at the body's mid-section. From belt line to rocker, the panels are curved inward, forming what is called a "coke bottle curve." The roof and tail are tapered into a bobbed fast-back and the quarter panels merge into the deck with a dramatically swooping curve.